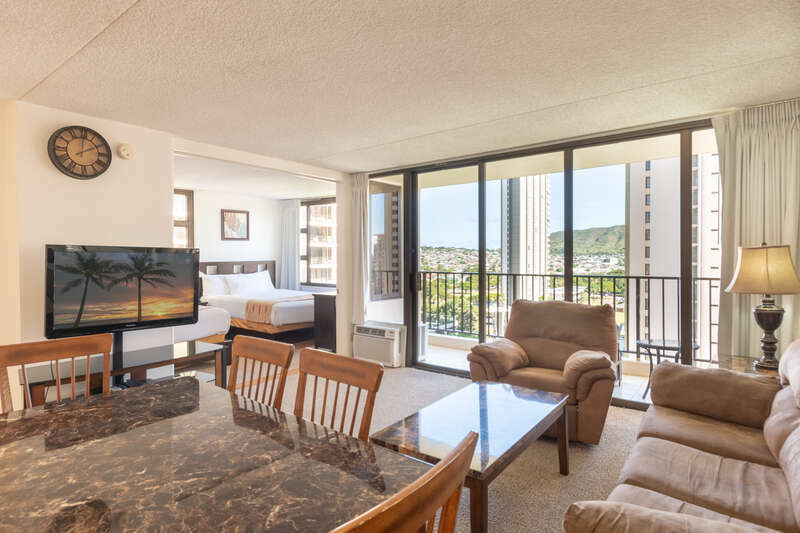 Take advantage of one of Waikiki’s best values with panoramic views of the ocean and Kapiolani Park. They are stunning! 3604-2 has modern kitchen cabinets and tile, newer carpet throughout the suite, and updated vanity. 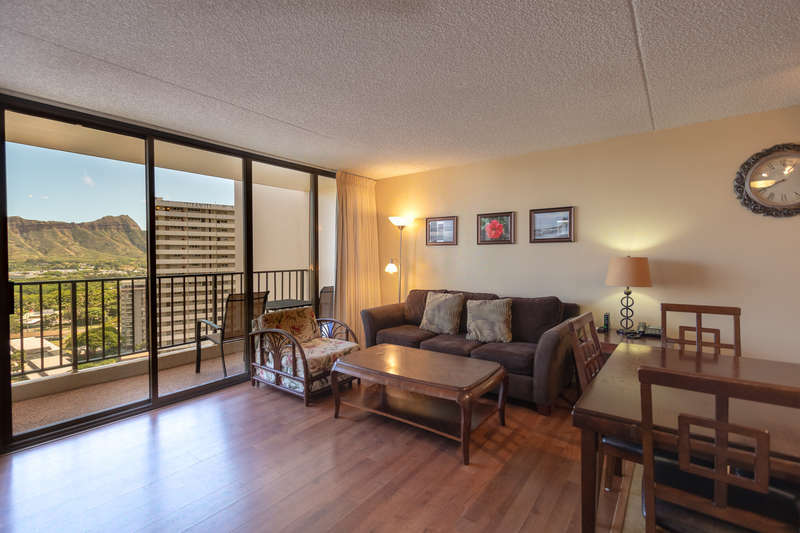 Plus, this unit is only one block from world-famous Waikiki Beach! Includes a fully-equipped kitchen and comfortable seating in the living room. Kitchen includes refrigerator, range, microwave, rice maker, coffee maker, and other kitchen wares. There is a dining room table set that seats six people. Convenient sleeping arrangements include a king-sized bed in the bedroom, along with a sofa sleeper in the living room. If additional sleeping capacity is needed, there are high-quality air mattresses available for rent. The bathroom vanity is updated. Enjoy privacy with the door separating the vanity from the toilet and shower. Save money and enjoy the convenience of FREE covered parking, FREE WiFi, and FREE local and toll free phone calling. If you use the bus, the stop is right next to the building. Take advantage of all of the extras we provide so you can get the most out of your vacation. 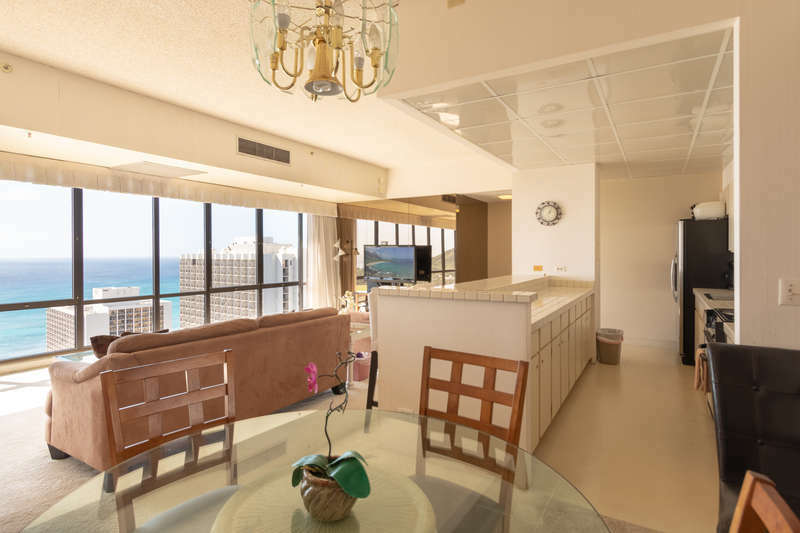 Complete with a tropical waterfall and koi pond, the upscale lobby will welcome you to one of Waikiki's most popular condo resorts. The recreation deck on the 6th floor is equipped with a swimming pool, two hot tubs, kids play equipment, tennis court, basketball court, barbeque grills, picnic tables, sauna, lounge chairs, and mini restaurant. The Banyan Breeze coffee shop is located on the 1st floor. 24 hour security is there to help you rest easy.